Novelist, translator and interpreter of Czech-Congolese origin who was educated at King’s College, London. Zmeškal was awarded the Josef Škvorecký Award (2009) and the European Union Prize for Literature (2011) and was nominated for the Magnesia Litera (2010). 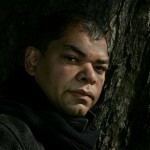 His books have been published in English, Polish, Bulgarian, Hungarian and Dutch. He was born in Prague in 1966. [‘Love Letter in Cuneiform’] is a very fine novel of (a few slices of) Czech life in the second half of the twentieth century, with a nice balance of the wildly imagined and the all-too-real. He has worked as a lecturer at Charles University and as a translator, interpreter and secondary-school teacher. He has given courses in creative writing. 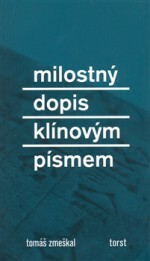 He made his debut with the novel Milostný dopis klínovým písmem (Love Letter in Cuneiform, Torst, 2008), which was enthusiastically received. The novel is set in the former Czechoslovakia and is about the romantic relationship between Květa and Hynek. Květa is Josef’s wife. Josef is imprisoned by the Communists. And Hynek is Josef’s main interrogator. In a review in Tvar, Pavel Janoušek describes Zmeškal’s writing thus: “Zmeškal’s prose is polymorphic in style, taking on diverse narrative forms and positions (from classic storytelling in the third and first person to the letter, biography, legend, fairy tale or historical commentary); nevertheless, the ‘labyrinth technique’ is the guiding principle of all its aspects.” For this novel the author was nominated for a Magnesia Litera and was awarded the Josef Škvorecký Award. 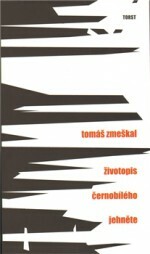 His second book was Životopis černobílého jehněte (The Biography of a Black and White Lamb, Torst, 2009), a considerably simpler, but delicate and tragically insightful work of prose. It depicts the 1960s–1980s under the Communist totalitarian regime, which the author characterizes thus: “History set its great big backside down on private moments of happiness and crushed them beyond recognition.” At the centre of the story are twins – half-breeds who are constantly bullied because they are different. Totalitarianism does not forgive otherness. 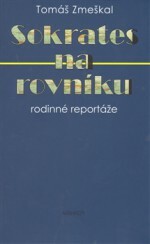 Tomáš Zmeškal’s third title is Sokrates na rovníku (Socrates at the Equator, Mishkezy, 2013), an autobiographically conceived depiction of the hunt for his father, which leads the narrator from the Czech Republic to Africa. It is a piece of reportage about the search for roots in the Belgian Congo and the history of the genocides there. Like the heroes of his previous books, here too the main character is an author “too black for Europe and too white for Africa”.